IPL season 3 has been the biggest and the most eventful season yet. We’re almost nearing the fag end of this season and the exhilaration has just risen to an all new level. The best part is that now, all the critics who claimed that the IPL would just be just another cricket tournament, have been silenced. We can safely say that this tournament is here to stay; it has already over taken some of the oldest and most popular tourneys across the world of sports. With the advent of new strategies by the IPL governing body, to make this tournament a global success, IPL is set to become one of the premiere sporting events in the world! Season 4 is only going to be bigger with introduction of 2 new franchises, Cochin and Pune. Who would have thought that, after all the shock and jaw-dropping that we saw in the first season when Mumbai bought their franchise for a staggering 112.9 million USD, that it was just an appetizer. I actually thought these guys were kidding when I read in the papers that the base price itself for the two new teams this year was 225 million USD. Like everybody else, I was speechless as well when I heard that the Cochin and Pune sides were bought for a whopping sum of 333.3 million USD and 370 million USD respectively. The older franchises can’t stop grinning because the values of their teams have shot up as well. 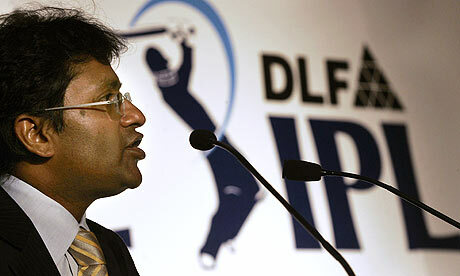 Lalit Modi, Chairman of the IPL, says that no new teams would be added to the existing ten at least for the next five years. “But you never know!” he adds. We also got to see some fierce bidding that happened a few months prior to the start of this season, where players like Keiron Pollard fetching up to 2.75 million USD. According to the inaugural Annual Review of Global Sports Salaries by sportingintelligence.com, IPL is the second highest-paid league, based on first-team salaries on a pro-rata basis. In the 211-team list currently monitored by average first-team pay, Royal Challengers Bangalore comes in at 12th, at an average of 57,833 pounds a week, standing two places above Manchester United. The IPL has edged the English Premier League, who has two teams in the list – Manchester United and Chelsea, IPL having three. The other two IPL teams in the top 30 are the Kolkata Knight Riders (£56,445) and Chennai Super Kings (£55,526). At No. 1 is the MLB’s New York Yankees (£89,897). All revenues generated from the IPL are directed to a central pool, 40% of which will go to IPL itself, 54% to franchisees and 6% as prize money. The money will be distributed in these proportions until 2017, after which the share of IPL will be 50%, franchisees 45% and prize money 5%. India’s biggest property developer DLF Group paid 50 million USD to be the title sponsor of the tournament for five years from 2008 to 2013. Other five-year sponsorship agreements include a deal with motorcycle maker Hero Honda worth 22.5 million USD, one with PepsiCo worth 12.5 million USD and a deal with beer and airline conglomerate Kingfisher at 26.5 million USD. The UK-based brand consultancy, Brand Finance, has valued the IPL at 4.13 billion USD in 2010. It was valued at 2.01 billion USD in 2009 by the same consultancy.There are disputed figures for the profitability of the teams. One analyst said that four teams out of the eight made a profit in 2009. The IPL signed up Kingfisher Airlines as the official umpire partner for the series in a Rs. 106 crore (approximately £15 million) deal. In 2008, it was announced that a consortium consisting of India’s Sony Entertainment Television network and Singapore-based World Sport Group secured the global broadcasting rights of the IPL. The record deal has a duration of ten years at a cost of US $1.026 billion. As part of the deal, the consortium will pay the BCCI US $918 million for the television broadcast rights and US $108 million for the promotion of the tournament.20% of these proceeds would go to IPL, 8% as prize money and 72% would be distributed to the franchisees. Sony-WSG then re-sold parts of the broadcasting rights geographically to other companies. Below is a summary of the broadcasting rights around the world. IPL 3 has seen fans flocking the stadiums in huge numbers, so much that tickets for all the remaining games have been sold out. This year even the team merchandise is selling like hot cake, fans are willing to pay up huge amounts for any sort of merchandise that they can lay their hand on to show support for their favourite teams. Team managements are finding it difficult to make space for more sponsor logos on their team jerseys. The TRPs of IPL 3 has shot through the roof. It has grabbed more eye balls that any other show on Indian television. IPL has gone one step ahead of its counterparts by inking a deal with YouTube, anyone who is on the move can now catch the live streaming of the matches on YouTube. It was a pleasure seeing a blimp for an Indian sporting event, here in India. IPL fans can now access live ball-by-ball video updates, action replays, video score cards and much more via their internet enabled hand held devices, a technology that will garner huge interest in the coming years. The IPL after parties have become a huge hit as well with booze, gorgeous models, great music & the biggest celebs in town. The IPL governing body has already hit their drawing boards formulating a plan to expand the IPL’s viewership base internationally as well. They’re already talking about having a mini league in Dubai and the US, primarily targeted at the Indian audiences in these countries. ICC would have no objections to this as it would only help them generate interest for the game in these countries & T20 is the best format that could work. If last season in South Africa is anything to go by, IPL with all its glamour & masala has the potential to tap into these markets as well. Lalit Modi is definitely the man of the hour, he may’ve managed to annoy quite a few people in the process, but his dedication to this enterprise is commendable. Within such a short span of time the IPL has cut across all factions of society & age groups. The future of the Indian club based games has never looked any brighter than this. Previous Is your knowledge pool draining? Next IPL to be ‘MODI’fied?